In January 1907, a hockey team from Kenora – comprising E. Girouz (goal), A.H. Ross (point), S.I. Griffis (cover point), T. Hooper (rover), W. McGimsie (centre), R. Beaudro (right wing) and T. Phillips (captain and left wing) – defeated the Montreal Wanderers in a best-of-three match in Montreal to win the Stanley Cup. The team was coached and trained by J.A. Link. The trophy, emblematic of this Canadian championship, had been presented by the Governor General, Baron Stanley of Preston, in 1892. Kenora is the smallest town to ever win the Cup. Visit the Ontario Heritage Trust provincial plaque at the Thistles Pavilion on Bernier Drive in Kenora, Ontario. 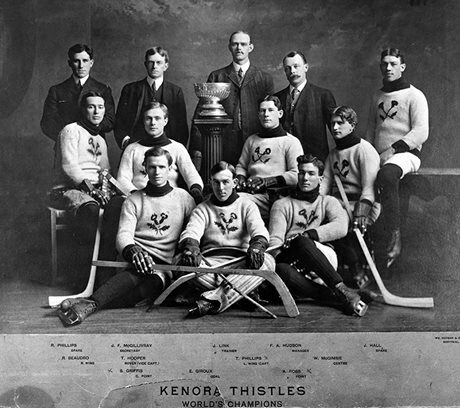 Read more about the Kenora Thistles on the Lake of the Woods Museum website. Learn more about the Kenora Thistles – including individual player biographies – on the Out of the Mists of the Past website. Visit the Kenora Thistles Senior AAA website.